Francisco Estevez died 26 Oct 1974 in Dayton, Montgomery, Ohio, at 76 years of age. He married Mary Anne Phelan. Mary was born in Borrisokane, Tipperary, Ireland 22 May 1903. Mary was the daughter of Michael Phelan. Mary died 1 Aug 1951 in Dayton, Montgomery, Ohio, at 48 years of age. Mary immigrated, 9 May 1921. Destination: Dayton, Ohio. The story goes that Mary Anne was sent to live with relatives in the United States to protect her from her father's and brothers' involvement in the Irish Republican Army (IRA). Manuel Estevez was born in Dayton, Montgomery, Ohio 14 Dec 1929. Manuel died Aug 1968 at 38 years of age. He married Roberta M. Amato. Roberta was born in Dayton, Montgomery, Ohio 30 Oct 1942. Roberta died 23 Sep 1998 in prob. Dayton, Montgomery, Ohio, at 55 years of age. Michael Jude Estevez was born in Dayton, Montgomery, Ohio 4 Aug 1933. Michael died 12 Jul 1981 in Los Angeles Co., California, at 47 years of age. Carlos Patrick "Charlie" Estevez was born Apr. 25, 1936 . Conrad died May 25, 2010 in Brownsville Cameron County Texas, USA, at 74 years of age. Ramón Gerard Antonio Estevez, aka Martin Sheen was born 3 Aug 1940. Joseph Estevez During a family trip in April 1959, he participated in the White House Easter Egg Roll and met President Dwight D. Eisenhower. He attended Chaminade High School, a Catholic High School located in Dayton. Upon his graduation, he enlisted and served in the United States Navy. Life: 1900-1991 [bapt. John Whelan; also Sean O’Faolain; Seán O’Faolain; err. Ó Faoláin]; b. 22 Feb. 16 half Moon St., Cork, third son of Denis Whelan, RIC member and Bridget (née Murphy), f 1921; enlisted in Cork No. I Brigade of IRA, and performed non-combatant duties chiefly as bomb-maker; salesman in Irish language book firm; served as IRA Director of Publicity [propaganda] in Cork and later Dublin, editing a Republican news sheet with Molly Childers and P. J. Little, and answering to Erskine Childers, 1922-23; ed. An Long; re-entered UUC, Jan. 1924; won Peel Memorial Prize and Ó Longáin Memorial Prize for a play, An Dán, in 1922; completed MA degree in Irish, 1924, with thesis on Daibhidh [Daithí] Ua Bruadair; partly published in Earna (1925); taught in Christian Brothers school in Ennis, Co. Clare; contrib. to Irish Statesman, 1925-29; completed MA in English and HDip. Ed. UCC; contrib. articles on education and Irish language to articles to Irish Tribune; left Ireland ‘with a strong smell of moral decay’ in his nostrils, holding Harkness Commonwealth Fellow, Harvard University,[...]"
Fulton Sheen helped deceive America by focusing on Communism when the true enemy was the Papacy. Communism is just another daughter of the Great Whore (The Vatican in Rome) and a Smokescreen! 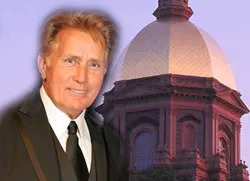 South Bend, IN (LifeNews.com) -- "The Jesuit/Catholic University of Notre Dame plans to honor actor and political activist Martin Sheen for his humanitarian work by awarding him the Laetare Medal. According to the college, the award also includes recognition for his pro-life stance, a rarity among Hollywood's elite and actors involved in liberal causes. The medal is the oldest and most prestigious honor given to American Catholics, the college says, and Sheen will receive it during a ceremony at the university's commencement in May." Although Martin Sheen has protested Abortion, which I protest as well, he also protests the death penalty. This is extremely miserable. He advocates skirting justice for the victim's families while keeping murderers in prison with our tax dollars. Let it be known also that it is mainly Catholic politicians that keep abortion legal. In other words, The CC is on both sides of the argument so that non catholics will be more likely to abort their children. Synopsis: In this drama, a conservative Catholic priest (Martin Sheen) representing the Pope is sent to Ireland to settle down a few influential radical priests whose doctrine is contrary to standard church guidelines. AKA The Conflict. ~ Sandra Brennan, All Movie Guide. From left to right: Mary E. Lyons, president of [Catholic] University of San Diego, Actor Martin Sheen, Ken Hackett, president of Catholic Relief Services, Father William Headley, dean of Joan B. Kroc School of Peace Studies, University of San Diego, Monsignor Dan Dillabough, vice president for Mission and Ministry, University of San Diego. Above is a very recent article showing Martin Sheen's dedication in continuing to aid the Jesuit Order via their Universities (Univ. of San Diego (Saint Diego). The Kroc mentioned in the article is the third wife of McDonald's CEO Ray Kroc. Martin Sheen and Activist Priest Fr. Bill O'Donnell protesting the shooting of Jesuits in El Salvador. They were shot for trying to practice Liberation Theology there. Which it was said that Jim Jones was attempting to practice the same thing in Guyana when they were all massacred. ploughshares activist Fr. Daniel Berrigan SJ. At 6:16 of Part 1 Coadjutor Sheen describes authentic pictures of Titanic before she sailed for the last time. These photos were taken by Irish Jesuit Fr. Francis M. Browne (referred to as "a vacationing priest") by Coadjutor Sheen never admitting Browne was a Jesuit nor does he explain why Jesuit Browne disembarked from Titanic after briefing Temporal Coadjutor Captain Edward John Smith that he had bring Titanic down deliberately and ignore any warnings of icebergs. Disclaimer-the following info (I'm paraphrasing) was on Wikipedia which I am not completely sure of in terms of veracity. I will see if more credible and reliable sources confirm this. Robert D. Ballard is reported to be the first to discover the wreckage of the Titanic. It is disputed whether Ballard truly found the remnants of Titanic because a Royal Navy vessel in 1977 according to https://www.paullee.com/titanic/titanicfound.html found it first. While Charlie was ranting on Alex Jones Psy-Op radio program, His brother and father were actively promoting their new Catholic based film at Jesuit Georgetown University in Washington DC..
Emilio Estevez, right, writer/director of The Way, starring his father Martin Sheen, said a pilgrimage allows people to "reestablish a connection to your community, to your faith, to yourself … to ultimately become a more whole person." February 22, 2011 – As a practicing Catholic, veteran actor Martin Sheen and star of the new movie The Way told a Georgetown audience Feb. 18 that he's always been curious about religious pilgrimages. Sheen and his son, The Way writer/director Emilio Estevez, were on campus for a special screening of the movie about the journey of a man (played by Sheen) making a pilgrimage on the Camino de Santiago or Way of St. James. In the film, his son (played by Estevez) dies on the historic trail. The pilgrimage's historic route is filmed from Saint-Jean-Pied-de-Port, France, to Santiago de Compostela, Spain. Sheen (whose real last name is Estevez) calls the film "a love letter to Spain," because his father emigrated from an area near Santiago to the U.S.
Martin Sheen, the star, and Emilio Estevez, the director, of "The Way," set in Spain in front of Cathedral of Santiago de Compostela. Cathedral History and Culture and Connection to the Spanish Inquisition. Charlie Sheen mocks Eric Phelps book Vatican Assassins and states in an interview with Alex Jones that they are "Vatican Assassins." Quote: "...Guys, it’s right there in the thing, duh! We work for the Pope, we murder people. We’re Vatican assassins. How complicated can it be? What they’re not ready for is guys like you and I and Nails and all the other gnarly gnarlingtons in my life, that we are high priests, Vatican assassin warlocks... "
Also, Check out my Blog for more on this Charlie Sheen Vatican Assassins rant.